The style 84 is a large format 12 sheet calendar, tinned at the top, displaying large formal date numbers quite visable from a distance. Moon phases are clearly labeled in descriptive print and in graphic form representing the changing look of the waxing and waning stages of the visable moon. The American and Canadian holidays prominently display, knocked out of the large date numbers within framed boxes; and each date also displays ascending / descending julians. 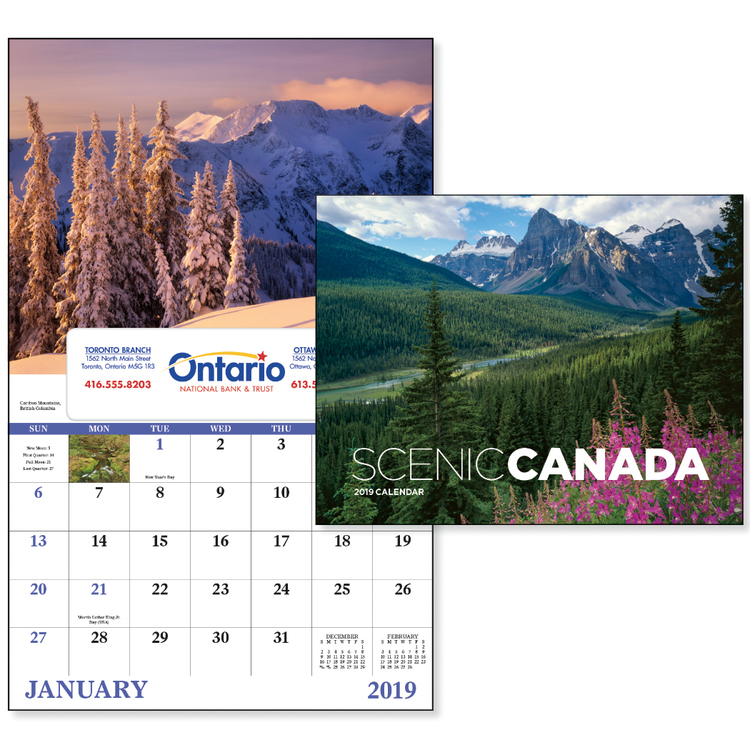 Border graphics are absent for an open format expressing a different look from most other calendars.Before and after months, along with the large month / year heading visually separate the ample ad space from the calendar pad. 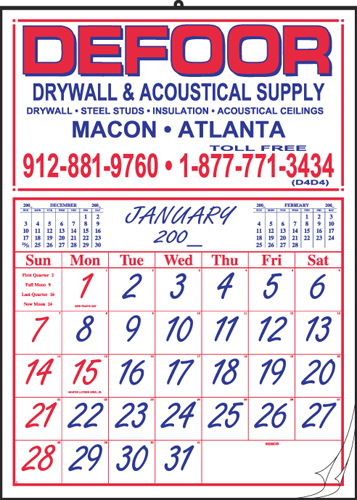 The style 60A calendar has large, bold numerals and a large ad space area. The moon phases are shown in both print and graphic form. The American and Canadian holidays are framed in a box over the date. The before and after reference months, and ascending julian dates are present also. The style 83 is a large format 12-sheet calendar, tinned at the top, displaying large script style dates that are easily visable across the room. The calendar features moon phases represented in descriptive print form and ascending julian dates. 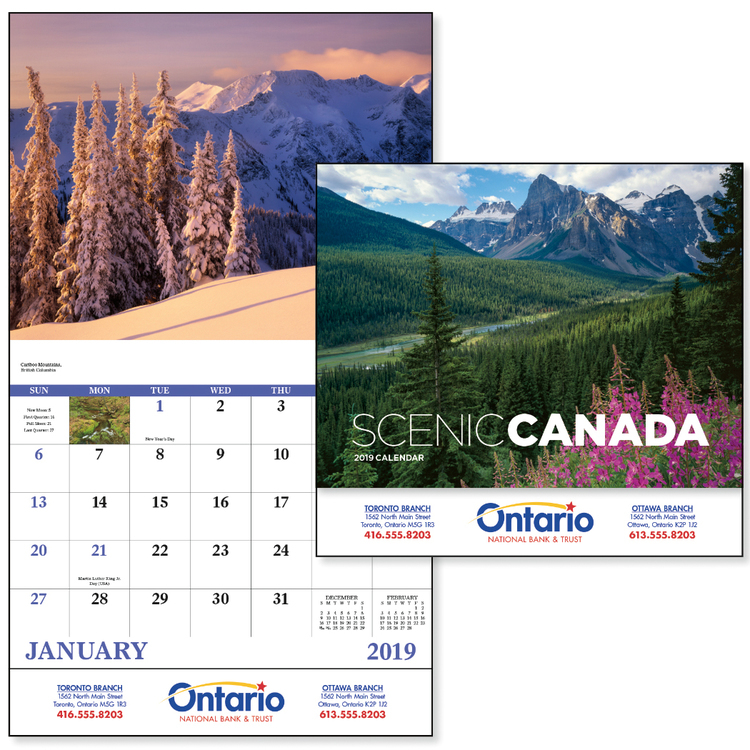 Two color printing distinguishes Sundays and holidays from the rest of the dates giving quick visual reference to important and upcoming events. American and Canadian holidays are noted and printed at the base of the date blocks. Before and after months set in a serif style font are displayed at the top of the pad for easy reference. 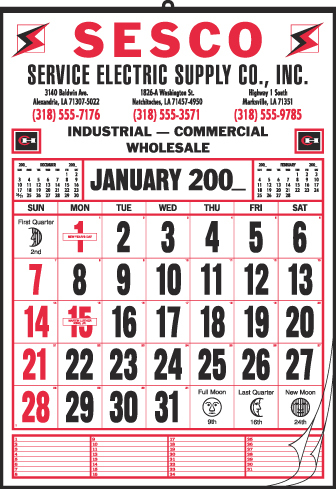 The style 653 calendar has large and bold numerals. The moon phases are shown in both print and graphic form. The American and Canadian holidays are framed in a box over the date. 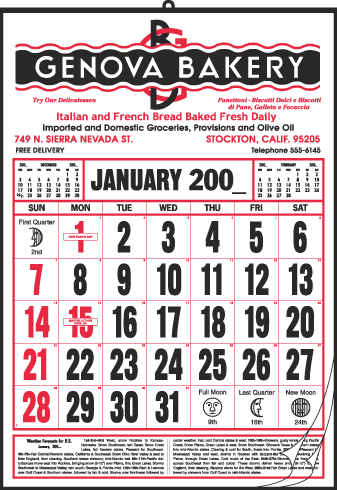 This calendar has ascending julian dates. The bottom panel is designed with daily notation lines numbered 1 thru 31 to write down notes in an easily visable area directly under the calendar pad area. Three month display business calendar. 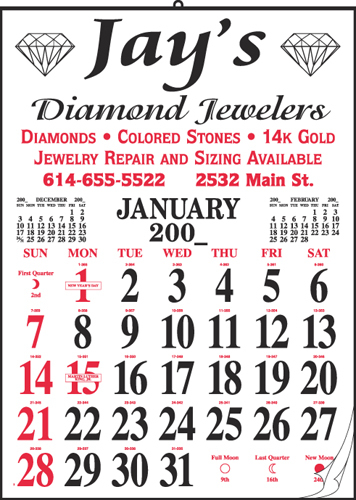 This twelve sheet has a dominant present month with before and after months in two colors. The present month shows moon phases, American & Canadian holidays and ascending julian dates. The present month, before and after months depict national holidays and Sundays with red ink. 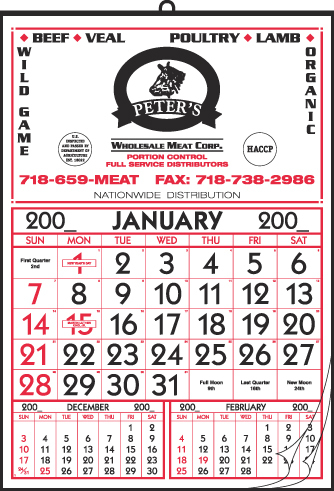 This single-sheet calendar is printed on quality grade enamel paper showing all twelve months of the year. This calendar is tinned at the top and bottom for added stability. The memo spaces provide adequate notation areas measuring 7/8" X 7/8". 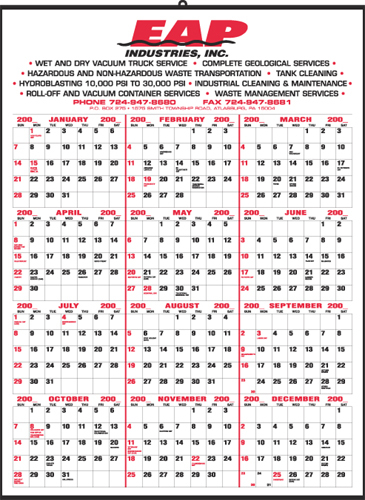 American and Canadian holidays are noted; the month, year, Sunday and National Holiday dates are printed in red ink. Medium size memo style calendar. This twelve sheet calendar has ample memo space (1-3/4" X 1-3/4") for daily reminders. This style has ascending and descending julian dates, American & Canadian holidays and moon phases in both print and graphic form. 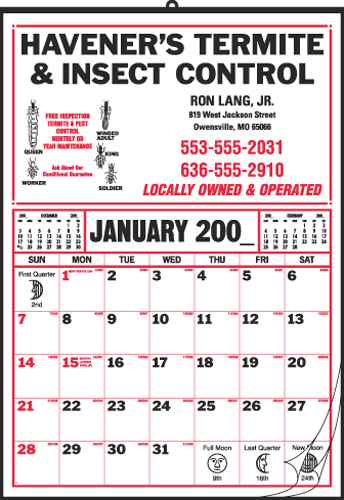 This is one of our most popular 12-Sheet Calendar styles. Medium size memo style calendar. 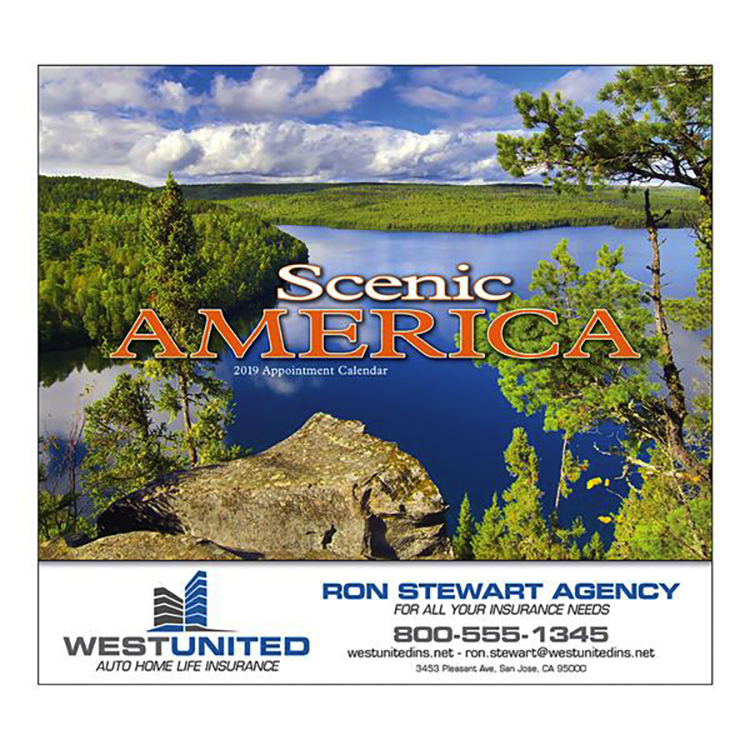 This twelve sheet calendar has ample memo space (1-3/4" X 1-3/4") for daily reminders with lines in the memo spaces. This style has ascending and descending julian dates, American & Canadian holidays and moon phases in both print and graphic form. 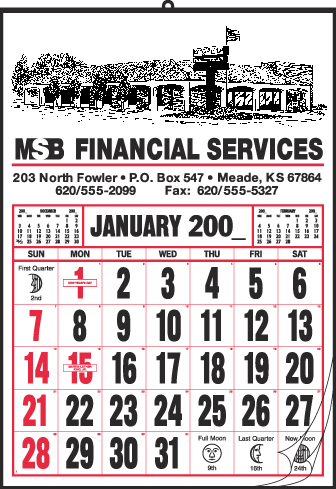 This is one of our most popular 12-Sheet Calendar styles. 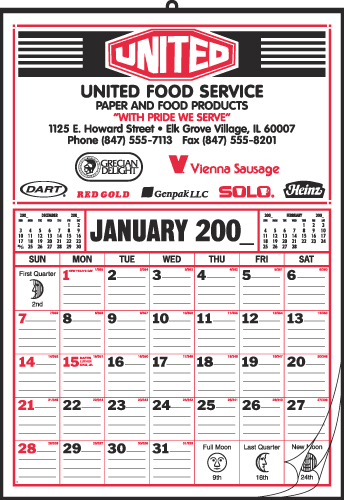 The style 60 calendar has large and bold numerals. The moon phases are shown in both print and graphic form. The American and Canadian holidays are framed in a box over the date. A monthly weather forecast panel is placed below the pad for the current month.